SpeedFreak IV - Sleek design 60CM wingspan super f.. Recently I got my first smart phone, I didn't use to like mobile phones I found them to be annoying. So being my 1st smart phone I expected some different feature and interface and I wasn't disappointed. It's only been 2 weeks since I got it yet I'm already developing apps, learned a fair about root interface and development and all kinds of things. 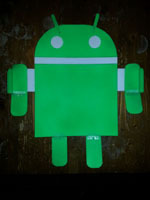 Android in my opinion gets a big thumbs up. When I seen the Android wifi Receiver unit for RC models on HobbyKing (linked above) I was keen to give it a go. However after lots of Googling I only found basic trainer models being used and 90% helicopter / quad etc based, none of which take my fancy. 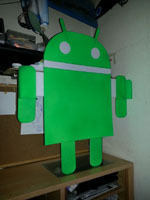 To begin I just grabbed a copy of the Android logo and decided where my control surfaces would be and how linkages would work, the build is really simple. I used 6MM Depron and with most sheets these days having a really stupid size of 90 * 40CM (wtf imo) I scaled the design to fit on 1 sheet. 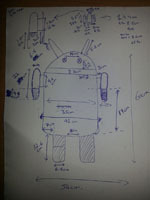 Here you can see my sketch with all measurements. You can see here I've marked out the pieces on my depron sheet and I still have pieces spare. At this point I was having a giggle to myself knowing how funny this is going to look lol. I used the cheapest spray paint I could find locally mainly because through experience I found unless you buy specific foam safe spray (Expensive) the cheaper the brand of spray paint the less corrosive it is. To increase stability and lower stall speed I added fins on the arm sides. Now all the control surfaces are tape hinged and have control horns ready to be rigged up. I used carbon fibre rod to enforce the antennas on the head all with UHU Por glue. 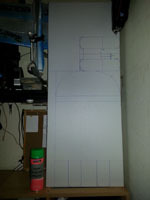 As the legs form the elevator I wanted the servo (Metal Gear) on COG line so it won't through off the balance. In the middle so the control line to each leg is about equal for equal throw movement on the control surface. I could afford to move the Aileron servos a little closer to the control surface itself by having the elevator servo forward. Now all control surfaces are rigged with lines and LOTS and I do mean LOTS of throw movement lol. Now with the motor installed in the middle on a 6*4 prop, Its a Hobbyking turnigy series parkflyer out-runner brushless motor (phew!). To keep the front looking as nice as possible I ran all servo cables and everything else possible on the back. I also added a 5MM*1MM thickness carbon fibre plate across the back onto each arm. This motor is designed for park-flying 3D models not more than 300g, this model is 190g lol.. 3D anyone??? :D Although before testing I know it does need duel rates or Expo (whatever you prefer) to dial down the input for launching and landing.